Unique and stunning, just like your sweetheart. 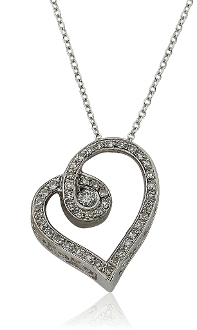 This Diamond heart slide pendant is certain to make her smile. Beautifully designed in fine sterling silver, this well-designed open tilt heart is completely outlined with shimmering Diamonds. And for added appeal, a brilliant round cut Diamond solitaire wrapped in a loop at the center of the design to represent ‘Hugs around the Heart’. A look from the side reveals ornate open scrolling throughout the edges of the slide; perfect for letting light shine out through the Diamonds. Radiant with 0.20 Carat t.w. of Diamonds and finished with a polished shine, this tilted heart slide suspends close to hers along a 16 inch cable chain that secures with a spring-ring clasp.